Klingon Chancellor Gorkon lifts his glass of Romulan ale in the air, looks across the table at carefully placed Star Fleet and Romulan dignitaries and toasts, “To the undiscovered country!” After a short pause and bewildered looks, he exclaims, “To the future!” Star Trek, a franchise that meticulously researches its subject matter in both movies and television, got it wrong! In the scene from Star Trek IV, The Undiscovered Country, Gorkon is hoping for a new and peaceful beginning to a forced alliance between the Federation of Planets and the Klingon Empire. 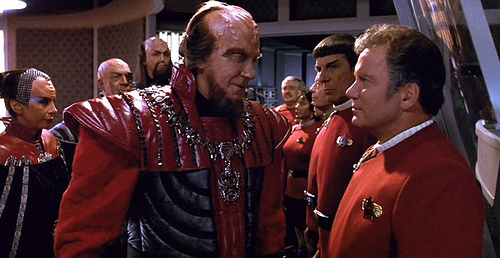 Surprisingly, the Klingons are well-read in Earth literature, especially Shakespeare, to which Klingon General Chang states to the ethereal Captain James T. Kirk, “You’ve not experienced Shakespeare unless you’ve read him in the original Klingon!” Ouch . . . taH pagh taHbe! Shakespeare wasn’t referring to an exciting and prosperous future when he wrote Scene I, Act III of Hamlet, “The undiscovered country from whose bourn no traveler returns.” His undiscovered country was death. In an earlier article (Time on your hands! ), I wrote that time fascinates us all. If time fascinates, death preoccupies us, for as time goes by, death draws ever nearer. The idea of mortality is difficult to accept for most people. Some soothe their perishable souls with the thought of an afterlife, while others find the concept of living beyond this life pure nonsense. Whatever your beliefs, whatever your religion or lack thereof, the promise of death is steadfast. It’s not going away any time soon. The problem with death may be that it is, as the Bard so deftly worded, the undiscovered country. Although some claim to speak with those who passed on, no one knows first hand what it’s like to be dead. Of course, that doesn’t stop everyone from speculating about death. Whether you’re religious, atheist, communist, or any other “ist” on a list, there’s an afterlife story to be told. The death business is good money, whether you bury people, manufacture headstones, build caskets, or just help boost the living to other side, like some doctors I know. In these professions, death is serious stuff, and with such finality, it’s no wonder that the fictional side of death is a blessed pastime. First and foremost are the great Bible stories that indoctrinate Sunday School tots, which always end happily in Heaven no matter how scary the journey. Then, there are some mighty fine legends from the ancient Greeks, Romans, Norsemen and Chinese. All promise the same thing– life will be better after death. I know no one who returned to tell me how great it is in the undiscovered country. Leave it to Hollywood, again, to spoil our tranquil vision of death. When it comes to Hollywood dying, we’re talking big money. Actors literally scramble for scenes to die for, as if a dying part in any movie or television show is the macabre equivalent of an Oscar. And it’s a double bonus if you can die and be resurrected a couple of times like Leonard Nimoy or William Shatner! Remember, Christ only managed one comeback from the grave, but then he doesn’t get $75.00 a pop for his autograph like Shatner. Be it an actor, a fan, or a holy man, everyone loves a death scene. My all time favorite actor for death entertainment is Vincent Price. Tall with a long, thin face coupled with the scariest voice of all time, Vincent Price relished in death, mystery, and the occult. He’s just plain spooky, and whether it’s a novel by Nathaniel Hawthorne or an eerie tale by Edgar Allan Poe, his involvement with stories by great authors is superb. 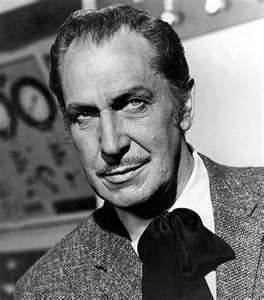 Vincent Price is in good company, with top spooky actors like Bela Lugosi, Boris Karloff, Lon Chaney, Lon Chaney Jr., and Christopher Lee to name a few. Each capitalized on stories about the twilight between life and death. Like the actors themselves, it allows all of us to enjoy the prospect of death without confronting it face-to-face. If you’re not Allison Dubois, you’re trek to the undiscovered country will be a new and exciting experience. You can only surmise what’s over the border– nothingness, Heaven, Valhalla, or Hell. A friend of mine, a writer and practicing attorney, firmly believes it’s the best deal we get! He explains that it’s the only thing we can count on and the dead all look so peaceful. Personally, that’s a deal I can live with! This entry was posted in Real life, Television and tagged death, Hollywood, murder, religion, shakespeare, Star Trek, terror, undiscovered country, Vincent Price. Bookmark the permalink.